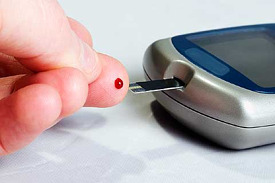 According to the American Diabetes Association, type 2 diabetes is the most common form of diabetes. With this type of diabetes, cells do not receive enough insulin. As a result, cells starve for energy, and, over time, a glucose buildup in the blood stream causes negative effects on a person’s eyes, kidneys, nerves and/or heart. Today’s fast-paced society has led to quicker, higher carbohydrate alternatives as food sources. As a result, there is a greater threat of developing diabetes due to cells becoming insulin-resistant. Niacin (nicotinamide) may help to preserve residual B-cell function in individuals with type 1 or type 2 diabetes. This B-vitamin is believed to be one of the components of the glucose tolerance factor (GTF). This mineral is involved in more than 300 enzymatic functions in the body. Magnesium deficiency has been associated with insulin resistance, glucose intolerance, dyslipidemia and hypertension, which have all been associated with diabetes mellitus. Magnesium has been found to be one of the more common micronutrient deficiencies in diabetes. Low levels of vitamin E are associated with increased incidences of diabetes. Research suggests that individuals with diabetes mellitus have decreased levels of antioxidants. Increased antioxidant requirements may be a result of increased free radical production during periods of hyperglycemia. This antioxidant has been shown to regenerate other antioxidants such as glutathione, vitamin E and vitamin C. Alpha-lipoic acid has been shown to enhance glucose uptake in skeletal muscle tissue, thus improving glucose regulation in diabetic mellitus individuals. In addition, this antioxidant can be beneficial in the treatment of diabetic polyneuropathy. Obesity is often associated with vitamin D deficiency and also with type 2 diabetes. Research indicates that diabetic individuals (both type 1 and type 2) have a higher risk for bone fracture. This vitamin deficiency has clearly been associated with lower bone density. Subjects with hypovitaminosis D are at higher risk of insulin resistance and metabolic syndrome. removes most of naturally occurring chromium. However, chromium can be supplemented or found in brewer’s yeast, nuts, meat, whole grains, green beans and broccoli. Homocysteine elevation is a risk factor for overall mortality in type 2 diabetic individuals independent of other risk factors. Adequate levels of pyroxidine (vitamin B6), folate and vitamin B12 are required for normal homocysteine metabolism. This nutrient is found in high concentrations in peripheral nerves. There is some evidence that inositol may be effective in the treatment of diabetic neuropathy. Research shows that a deficiency of vitamin B6 may result in abnormal glucose tolerance, degeneration of the pancreatic beta cells, reduced insulin response to glucose and reduced serum and pancreatic insulin levels. In addition, vitamin B6 deficiency has been associated with polyneuropathies. Studies have shown that individuals with a low intake of calcium have an increased risk of non-insulin dependant diabetes mellitus. Numerous studies have also revealed that diabetes may be associated with abnormal regulation of intracellular calcium. This mineral has been associated with over 200 enzymatic functions in the body. Increased fasting blood glucose levels have been associated with low zinc. Zinc has been shown to be important in the synthesis, storage and secretion of insulin. Increased urinary zinc excretion has also been associated with diabetic individuals. This amino acid in the form of acetyl-L-carnitine has been shown to benefit those individuals with diabetic polyneuropathy. One of the proposed mechanisms is that this amino acid may restore the depleted nerve myoinositol content and decrease free radical production.